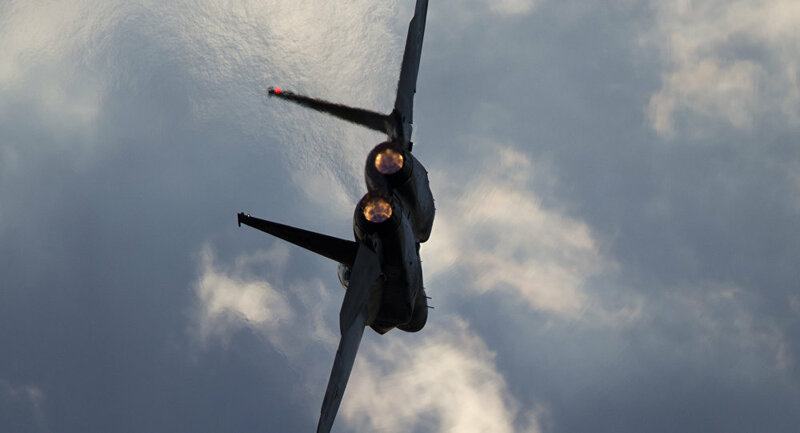 Israeli forces reportedly struck targets near Damascus on Tuesday with missiles, according to Al Masdar News, just hours after US President Donald Trump withdrew from the Iran sanctions deal. Syria's SANA reports that air defense systems intercepted at least two missiles fired at the al-Kaswa area, which is proximal to southern Damascus. ​Syrian Army sources appear to have confirmed that the attacks were initiated by Israel, according to social media reports. Social media reports emerged within an hour of Trump's speech announcing Washington's exit from the Iran nuclear deal that Israeli Air Force jets were striking Damascus. Trump made the announcement around 2:20 p.m. Washington time; reports of the strikes were showing up by just after 3 p.m.
A source at the Beirut International Airport told Sputnik that Israeli combat aircraft were in the Lebanese airspace at the supposed time of the strike on Syria. Initially, multiple news outlets reported that no casualties were sustained. A few hours following the strikes, SANA reported that at least two people died. According to security analyst Michael Horowitz, "a convoy may have been targeted rather than an actual base." ​In addition to Trump's withdrawal from the Iran nuclear deal, Israel forces were put on high alert in the Golan Heights. The Israeli military refused comment on their alleged involvement in the attack, telling Sputnik, "We do not comment on that." On top off the flurry of developments, US Secretary of State Mike Pompeo is traveling to North Korea today.